One of the many strengths of the Millcreek team is growing and providing specialty products for our customers! 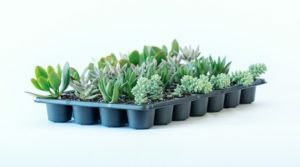 We have expanded our Succulent line and now offer Mixed Trays of 28 Succulents in 2″ pots! Contact sales at 800-948-1234 or check out our availability list to order. A ready-to-sell table-top tray of three assorted non-hardy Succulents. Look for it on our Spring Availability. Succulents are wonderful for outdoor containers, mixed planters, and as houseplants. They provide wonderful color and texture. Full sun is generally preferred and plants only need occasional watering once established. 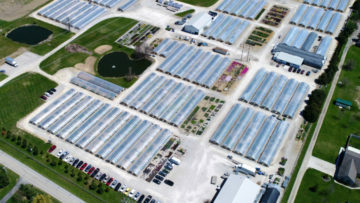 Let us help you sell more plants in your Garden Center this year! NEW FOR 2019 we have redesigned our popular POP signs! Our POP package includes 12 colorful signs to educate your customers and help them find the plants that meet their needs. Your logo will be placed on each sign. Contact our Sales Team at 800-948-1234 or sales@millcreekplants.com to order. Are your customers feeling overwhelmed about the herb selection process? Our large signage will help you promote the ease of selection of Herbs for the Kitchen Essentials 6-Pack and includes a space for you to put your pricing or other information. Our brochure contains information about the top culinary herbs as well as tips, recipes, and flavor suggestions. It’s perfect for those shoppers who are new to herbs or even those who want to learn more. Our 6-pack trays fit our 3″ herb pots with an easy-to-carry handle making it easy for customers to just grab ‘n go! * We recommend ordering 12 flats of Millcreek quality herbs with this package. * We recommend ordering 25 flats of Millcreek quality herbs with this package. To order, check our our weekly Availability List or contact our Sales Team at (800) 948-1234 or sales@millcreekplants.com.